Paella is a saffron-infused rice dish that is traditionally cooked in a shallow pan to create a nice, crunchy bottom. It uses a lot of ingredients, many of which are seafood, and people often find this to be a very intimidating dish to make at home. 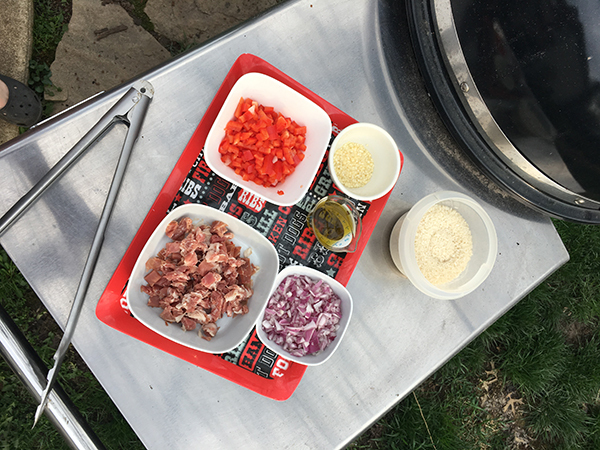 Having a triple-tested recipe with step-by-step instructions from Weber's Way to Grill, and advance preparation are the keys to tackling this delicious Spanish classic in your backyard. Scroll all the way down for the full recipe! Make sure all of your ingredients are prepped and measured before you start cooking. Put them in bowls for easy transport from the kitchen to your backyard. Since each step of this recipe moves fairly quickIy, I had everything on a sheet tray on my sidetable next to the grill. Special equipment needed: Gourmet BBQ System Wok, or a 12-inch cast iron skillet. Using the Gourmet BBQ System is a great and fun way of grilling foods you don't normally think of to put on the grill. And no mess in the kitchen! 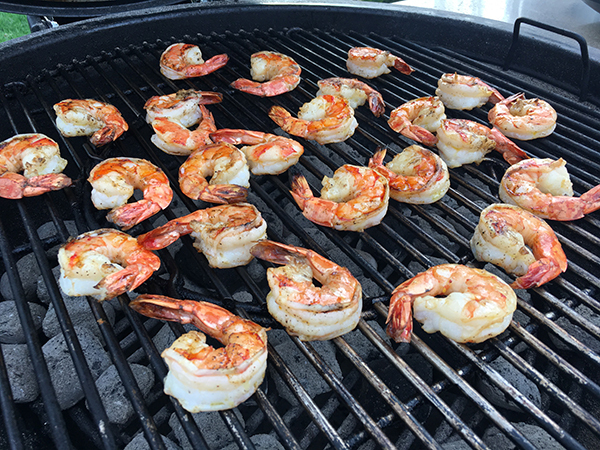 Prepare the grill for direct high heat and grill the shrimp about two minutes per side, turning once. 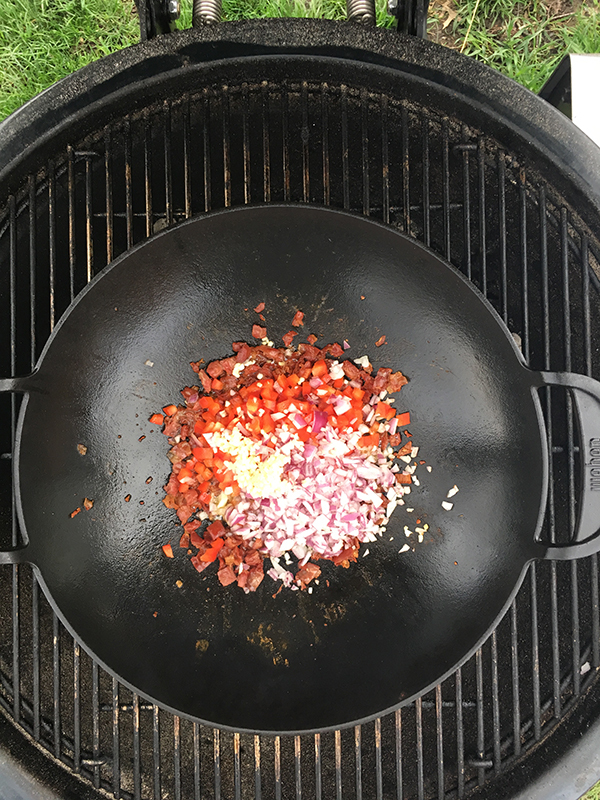 Once the shrimp is done cooking, place the wok on the grill directly over the charcoal. Carefully add the oil and prosciutto. Add the onions, garlic and bell pepper. Add the rice. Stir until everything is combined. Add broth, close the lid, and let the rice simmer for about 15 minutes or until al dente. Next, add the seafood, close the lid and cook until the mussels open, about 8-10 minutes. Enjoy with friends and family! This recipe makes enough for 6 people or 2 people with leftovers. 1. Peel and devein the shrimp, reserving the shells to make the broth. In a large bowl toss the shrimp with the oil, and season evenly with salt and pepper. Cover and refrigerate until ready to grill. 3. Check each mussel and discard those with broken shells, any that don’t close up when you lightly tap on their shells, and any others that feel unusually heavy because of sand trapped inside. 4. Prepare the grill for direct cooking over high heat on one side and medium heat on the other side. Brush the cooking grates clean. Grill the shrimp over direct high heat until cooked halfway, about 2 minutes, turning once (the shrimp will finish cooking in the broth). Remove from the grill and set aside to cool. 5. Place a 12-inch cast-iron skillet on the cooking grate over direct high heat. Heat the oil in the skillet. Add the prosciutto and cook, stirring occasionally, until it begins to crisp, about 3 minutes. Add the onion, bell pepper, and garlic. Cook, stirring occasionally, until the onion is translucent, about 5 minutes, rotating the pan for even cooking. Slide the pan away from the fire. 6. 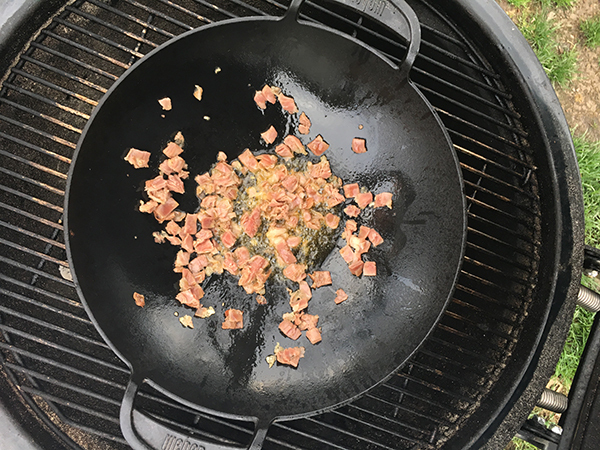 Place the skillet over direct medium heat, stir in the rice, and cook until well coated with the pan juices, about 2 minutes. Stir in the shrimp broth and the frozen peas. 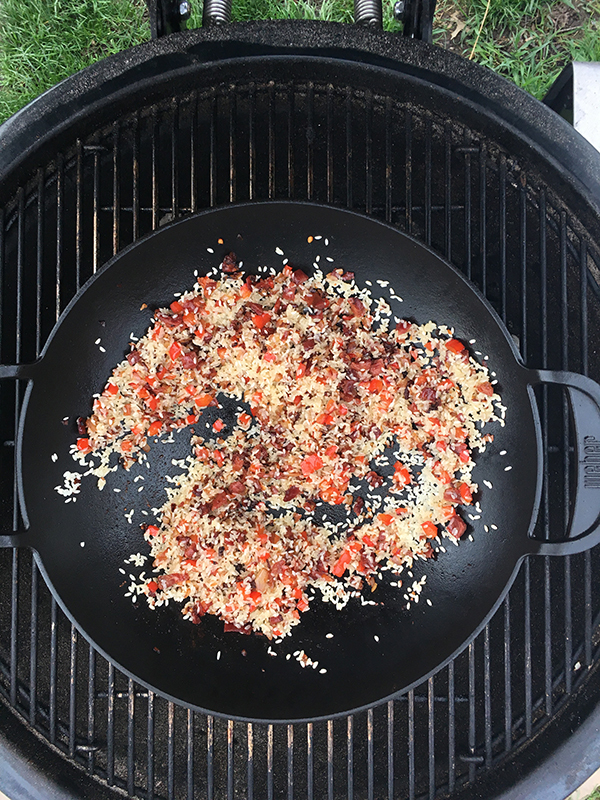 Close the grill lid and let the rice cook at a brisk simmer until the rice is al dente, about 15 minutes. Nestle the shrimp into the rice. Add the mussels, hinged sides down. 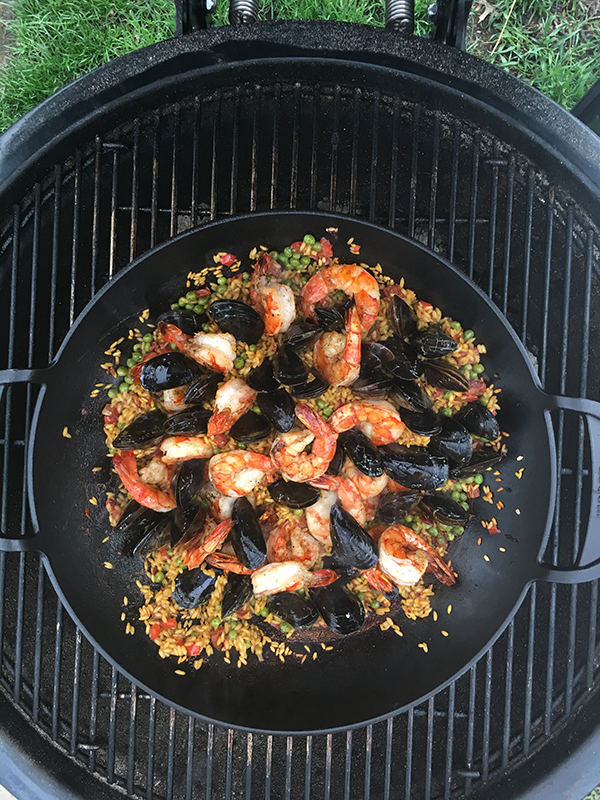 Cook, with the grill lid closed, until the mussels open, 8 to 10 minutes. 7. Remove from the heat, cover with aluminum foil, and let stand for 5 minutes. Serve hot from the skillet. ©2008 Weber-Stephen Products Co. 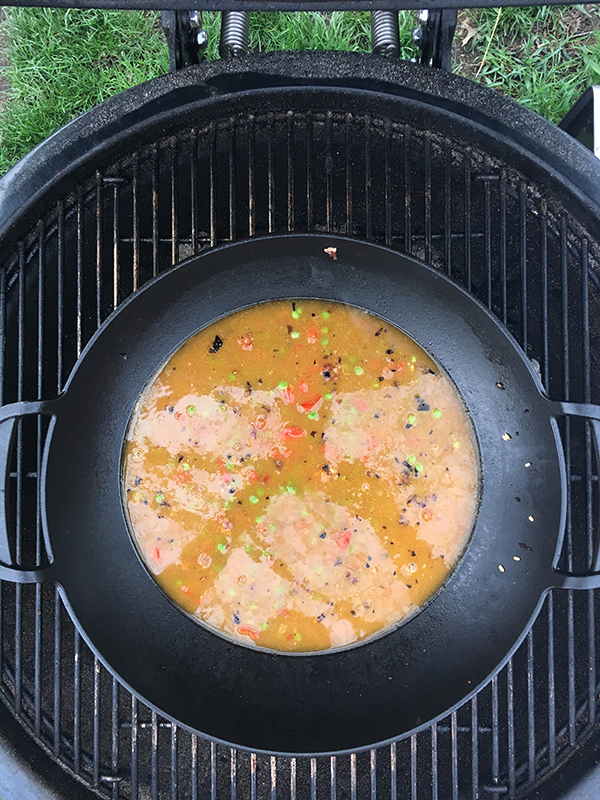 Recipe from Weber’s Way to Grill™ by Jamie Purviance. Used with permission.